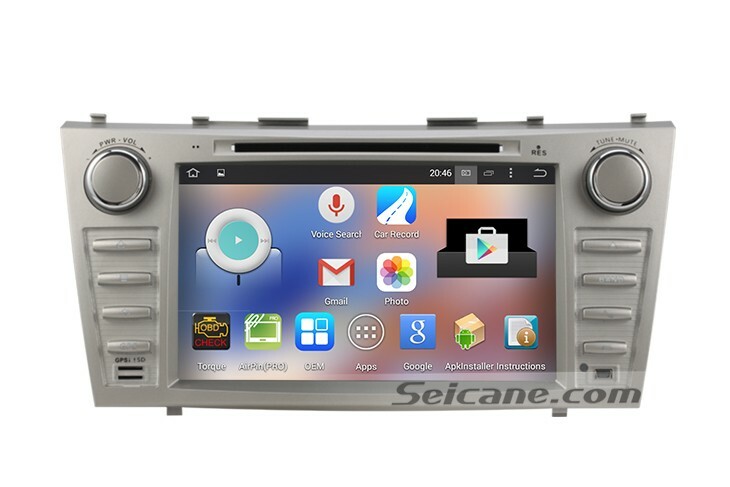 This is a popular 2007-2011 Toyota Camry car stereo from Seicane. It can support internet surfing via 3G network or WIFI. And WIFI module will come with the unit. Getting connection with 3G internet or a WIFI hotspot, you can go through various kinds of websites with quick Google search box, play online games, listen to online music, watch online videos, etc. You can also download thousands of apps on the Android market, such as Skype, MSN, Gmail, facebook, Twitter, etc. It is built with the latest GPS navigation for you to find your best way to your destination. It can provide lane assist, landmark display, 3D street view, intelligent route planning, turn-by-turn direction and voice prompts for you to get to your desired destination within the shortest time. In addition, this remarkable Toyota Camry car stereo also comes with a lot of practical features and entertainment options for you to meet your different needs in your car, including DVD player, Bluetooth hands-free calls, Bluetooth music, FM/AM radio, RDS, TV, iPod, USB, SD card connection, etc. When you have a good unit like the Toyota Camry car stereo, you must want to keep it working well for a long time. Just as the same as a mobile phone, you need to upkeep a car stereo at intervals if you want to keep it in good usage. To make a car stereo work smoothly, you can upgrade the software constantly. When there is the latest version for the car stereo software or an app in the car stereo, you can download and install it, which can ensure that you won’t miss the latest features and make the stereo work faster and more smoothly. Besides, you need to clean it at intervals. First of all, it’s the screen of the unit. Most car owners operate the stereo with their hands, so you may easily find there are a lot of finger prints on the screen. When you open the door or windows of your car, dusts may easily go into your car and stay on the screen of your stereo. In that case, it’s necessary for you to clean the screen. You can clean it with a piece of dry soft cloth. If you find something hard to remove, for example oil stains, you can use cleanser to remove it and clean it with a piece of dry cloth. Remember to clean it as gently as you can. Next comes the disc player. The most important part of a disc player is the DVD laser. It’s vital for you to keep it clean if you want to keep the DVD player working well in a long time. You can clean it with detergent once or twice a month. More importantly, you should insert clean DVD discs into it. The above is the basic ways on how to maintain a car stereo. Wish it can be helpful for you. If you want to replace your car stereo and are still looking for an ideal one for your 2007-2011 Toyota Camry, I’d like to recommend this Seicane Toyota Camry car stereo for you. Wish you like this amazing Seicane Toyota Camry car stereo and enjoy your journey with it!